Post subject: Bad front wheel bearing/hub? A few days ago, I noticed my TRAC LOSS light would come on for a few seconds and go off while driving on a smooth road. Then the TRAC OFF and ANTI-LOCK LIGHTS would come on and the DIC would say SERVICE STABILITY SYSTEM. The lights would go off when the car was restarted. Now I'm starting to get a clunk or thump when making left turns and hitting bumps sometimes. I'm guessing it's a rapidly disintegrating wheel bearing/hub. There's no other noise or rumbling coming from the bearing. Odd thing is it was changed when I got my inspection last year at the place I bought the car from. I'm guessing he used the cheapest bearing he could find because he had to eat the cost. Is there really a difference between brands or are they all made in China now? Post subject: Re: Bad front wheel bearing/hub? get the car off the ground and check them for play. who knows what the mechanic put on the car....warranty? The guy gets his parts from Advance Auto, so I'm guessing he got the Driveworks (cheapest) one. Pretty much the only choice with stores near me are the "house" brand (Driveworks, Duralast, etc.) Or Moog. At least the Moog has a three year warranty. Just don't want the thing coming apart on me while I'm driving and losing a wheel. Gonna park it when I get home tonight till I can look at it this weekend. I have the "knock knock" intermediate shaft issue (next on the "fix it" list after this). Could it be getting so worn that play is causing issues with the steering wheel position sensor?? only an expensive scantool will pull body data. go with the moog - they made reliable front end parts for me!! It was quiet on the way to work this morning. On my way home it made a few noises. Best described as a single solid thump noise. Sometimes it will do it hitting a bump, sometimes just turning the steering wheel and (only left). If it wasn't for the TRAC LOSS and SERVICE STABILITY SYSTEM warnings I'd say it's an upper strut bushing. I'll jack it up tomorrow or Saturday and start pulling on stuff and see what I find. Well I got it on the jack. Wiggled the wheel left to right. Only play and noise is the intermediate shaft play. Wiggle top to bottom, no play. So it isn't a wheel bearing. No movement in the strut so it's not the upper bushing. Take the wheel off and look around. Spindle nut tight. Control arm bushings are cracking but there. Then I see it. At least I know my wheel isnt gonna fall off. Wheel bearings/hub don't usually go thump when they wear out. I think you found that issue with the stabilizer link. But something else is making the warning lights go off for TRACTION. shaking hard. It will get worse and eventually let you know if its the hub. Hopefully your ABS, traction control pump is not going out. I felt the thump could be coming from a binding break caliper, which would have pretty much been the only thing holding the wheel on. I read somewhere that a bad lower control arm can cause ABS warning light issues. 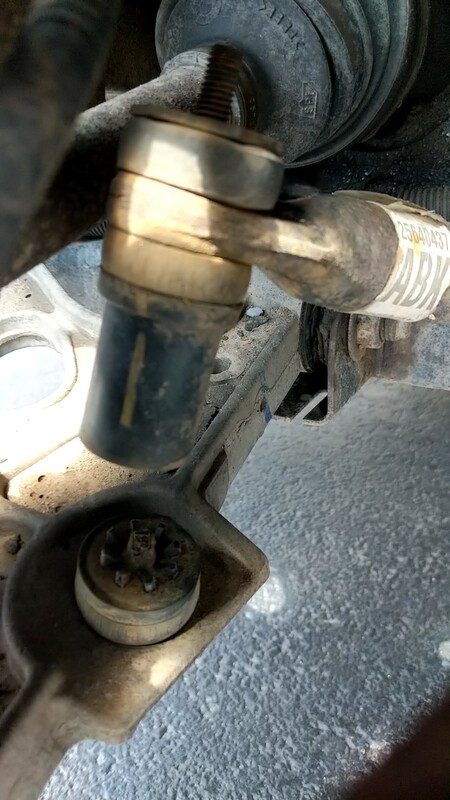 With the sway bar link broken, maybe I'm getting more wiggle from bad control arm bushings. Does having worn break pads cause ABS faults? Worn brake pads or worn control arm bushings won't cause ABS faults. but not brake pads or control arm bushings. timken front wheel bearing part #? Bad Wheel Bearing?? Help please!